Full disclosure – I was provided an advance copy of this book by the author however have voluntarily chosen to write a review. All opinions are my own. 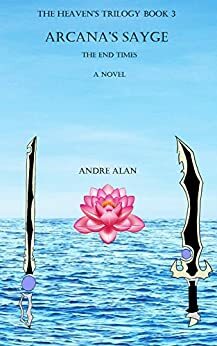 Arcana’s Sayge The End Times is the third and final installment in the Heaven’s Trilogy series by Andre Alan. The world where the action takes place can best be described as a mixture of science fiction and fantasy. While many staple fantasy species are present such as Elves, Gnomes and Orcs, the author also incorporates Sci-Fi elements such as hovercraft, laser guns that can be converted to several weapons, exosuit armor and even robots. Adding in modern elements such as televisions, traditional houses, the internet and other creature comforts and you have a genre mash up that I don’t believe has ever before been attempted. The action starts fast and we soon learn that the estranged twin of the hero is colluding with forces on the dark side to usher in an evil that will destroy the world. To stop the darkness from spreading, several nations of good must put aside prior differences and grudges to work together against the growing armies of dark. However, the dark nations have also banded together under the “Dark Cloud” and are assembling for what appears to be a battle for all planet Threa. Since I have not read the previous two books in this series it took me a good portion of the text to figure out who was who and where everyone’s allegiances lay. When I thought I had it all figured out I still found myself getting momentarily confused when a reference was made to a past event, item or place not previously mentioned. I chalked it up to coming in on the middle of the story and moved on. I really liked how the more advanced technology was woven throughout the story side by side with more arcane items and techniques. I have read many fantasy series in the past and was mildly pleased to see that some of my preconceptions of certain races, namely gnomes and dwarves, based on other novels were similar in this book as well. If nothing else, that aspect helped me be not as lost as I found myself. In fact, there were many times during my reading that I wished there was a primer or a cheat sheet for me to keep all the people, places, artifacts and rivalries in order. Imagine my surprise when I finally reached the end of the book only to find the glossary. I feel that the author would be better served to put this at the front of the story as a reminder and for easy reference. If doesn’t happen, here is your handy tip. I must confess, after finally making it to the end of Arcana’s Sayge I didn’t have the energy to read the glossary. For those familiar with the previous books in the series, this final chapter will most likely be a satisfying read and provide an exciting climax. Unfortunately, for me, I just found there to be too much going on to keep track of all the events and nuances.